Download the course information kit AND receive our FREE 3-part Enterprise Risk Management training series. After attending this course: I have a clear idea of what I need to do; More importantly, the ERM as a tool is clearly more important to the success of an enterprise than I though before attending the course! NEW: Optional CERMS™ certification exam (via online). Those who successfully complete & pass the certification exam are eligible for the CERMS™ designation. Certification exam is administered on the last day of the live training. Alternatively, you may choose to take it online after completing the course. Professionals that deal with the complexities of organizational risk management function on a daily basis. 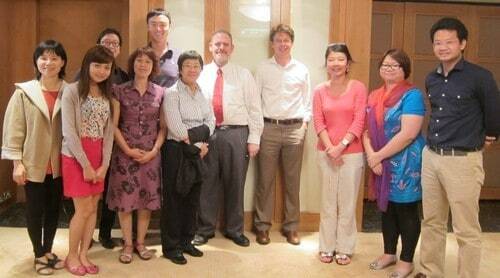 “Richard is one of the best speakers I ever had in short course. Full of fun & energy.” – S.L. “Although this was my first experience studying online, it showed me that technology plays an important role in the transfer of knowledge. Secondly, this online presentation by Ethan Hathaway goes the extra mile of presenting Case studies which helped greatly in understanding the basic application and benefits of implementing Enterprise Risk Management (ERM) across an entity. 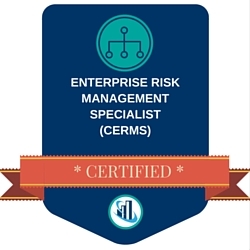 This digital badge designates you as a Certified Enterprise Risk Management Specialist (CERMS)™, which you may use on business cards, resumes, LinkedIn profiles, website profiles, email signatures and more. In addition to the Certificate of Completion for the course in general, if you successfully pass the Certification exam, you also receive a digital printable CERMS™ Certificate to mark your achievement. As part of your successful certification, you also receive a full year's access to the EH Brain Trust Library to help you keep up-to-date on the industry issues. In order to keep your status as a CERMS™ in good standing, you need to regularly take Continuing Professional Development courses.